Could be the collection of the legendary lefty Mark Lang....? Some beauties in the completed section....wow! I always wondered what was going to happen with his collection. I assumed that someone on the forum would have found a way to acquire it. Didn't he have hundreds of gloves? And lots of Glovesmiths? He always talked about his impressive collection but I don't remember him ever sharing any collection photos. Is this right? This seemed odd for someone who bragged so often about their collection. I would have loved to find that he was secretly hoarding Carpenter gloves! These are selling for pretty good prices. I think you are correct to assume that these come from the collection of the late Mr. Lang. 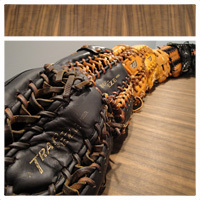 I sold him a few gloves over the years, and will keep an eye out for these on eBay. I guarantee that these are selling for less than he paid to acquire them. Kinda weird seeing a deceased board member's gloves, go up for sale on eBay. Makes me remember some of the epic online battles he had with a couple of members here, in the wayback. It has been a few weeks, and many auctions have ended. anyone pick up a few pieces of history with this seller on Ebay? 100% sure that its the Moose's collection. I've bought a few. And I had one big fight with him, unfortunately in his last year on earth. He was a great source of info but could rub you the wrong way. We had good years, bad years. Overall, good. Luckily one of my son is a lefty, he does have a very impressive collection, too bad I just join the forum, would have learn alot from him. That is a nice pickup! Im not knowledge enough to know if any of his current auction (or who ever lucky enough to bought out his collection) are Horween. I did saw a few Oil Tanned. and a 3 dots (I think). But I dont know enough to pull the trigger. If I found something that I am not sure of, I will post it here and hope a few vets can identify them. A few more listed today. I know I sold Mark a few of these gems. He would have me ship them to his friend in Texas, even though I offered to ship directly to him in Canada. Just another Lefty oddity. Yeah, I have seen a few that Mark bought from me as well. Just know that they most likely will have a stale smoke smell to them. He used to be a smoker back in the day. so sad to know the owner has passed away. Still at it. Oh the memories... Threats... And hate mail! I picked up a NWOT PRO-2 from this seller. I was not aware of this thread or the history of the previous owner/board member at the time of purchase. Such a shame as the glove was unused. I would never advocate gaming a USA glove, but I enjoy immensely having a catch with my son using some of the greatest steerhide ever crafted. Anyone know what is Mark's handle in this forum? I would like to do a search on his old post and learn something. It was glovenut 1 and lefty 1 and some others SIDEWINDER maybe? Many of his posts and threads were deleted or he was blocked on and off on here. I personally did not think he added much value on here. Most of his posts were attacking other people. He's got some "good" stuff on the vintage forum too. As the receipient of one of his expletive, offensive (and I really dont think much is offensive in this world) laden emails or messages, he did keep things interesting thats for sure.